Raleigh’s climate is hard on the wood on the exterior of your home. Our hot, humid summers paired with our cold, sometimes very dry winters put a lot of stress on the parts of wood that are exposed to the elements. Rotting wood cannot be ignored so before we paint the exterior of your home, we look for signs of wood rot. 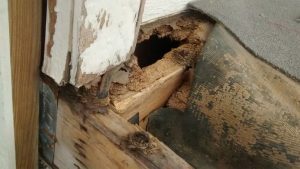 While cosmetic damage can sometimes be cleaned out like a cavity, then filled and painted, large portions of rotting wood must be replaced before the damage spreads and you’re left with a huge repair bill. Other painting companies either ignore the damage or merely inform you of it, we pride ourselves on our wood rot repair services, which include priming and caulking when needed. Rotted wood is one of the worst home repairs to overlook. Deciding to put off repair or replacement can cause serious structural issues and results in much more extensive repairs later. We always recommend addressing your wood rot repair issues when they’re discovered. Our crew begins by thoroughly inspecting the entire house for damages. If we find anything during our inspection, we notify you of the damage, our recommendations, and how much the repairs will be. Once this has been approved, the wood repair will be rolled into our exterior painting project schedule, and you won’t have to worry about it anymore! Siding – Whether your home has vinyl or aluminum siding, chances are the home is still supported by a wood frame. When moisture gets under the siding to the wood below, the environment is perfect for mold, mildew, and fungus. If left untreated, these growths, along with the moisture itself, will weaken the wood. Decks and Add-ons – Your deck is exposed to all the elements, all the time. Osborne Painting offers extensive deck inspection to pinpoint areas that need repair or may need it in the future. Windows – Rotted wood is common on window sills and window frames. When water accumulates on or around the windowsill, it slowly wears away the existing paint. Since paint acts as a waterproof barrier, its wearing away allows water to seep into the wood and cause rot. Doors – Nearly all exterior doors contain wood, making them susceptible to water damage. We pay special attention to the lower sections of the door as they’re prime areas for mold, mildew, and fungus. Trim – Wood trim is everywhere, it’s that simple. Let us check your wood trim out to determine areas that are susceptible to rot. If your home needs wood repair in addition to exterior painting, we’re here to help. Our team does a thorough pre-painting inspection, and will let you know if we discover any damage before we start painting so you can get ahead of any damage.